Wall Street isn't paying much attention to WD-40 Company, Control4, or VSE Corp., and that could be to your benefit. One of the things legendary investor Peter Lynch looked for when seeking out stocks to buy was to find those that don't have a lot of attention from Wall Street. That either meant a low rate of institutional ownership, or a lack of research analysts covering them. It was his belief that superior returns could be found in these under-the-radar stocks. In the spirit of Lynch's investment principles, we asked three of our Motley Fool investors to each highlight a stock Wall Street isn't paying much attention to, but could be a great investment. Here's a brief look at their selections: WD-40 Company (NASDAQ:WDFC), Control4 (NASDAQ:CTRL), and VSE Corporation (NASDAQ:VSEC). Tyler Crowe (WD-40 Company): WD-40 isn't anything new, the product has been around for decades and the stock has been public for more than 40 years. Despite its long-tenured time as a publicly traded company, Wall Street has barely ever paid attention to it. Only two analyst firms have active recommendations on it, and the last time the stock was upgraded or downgraded was over two years ago. Too bad for them, and all the better for those that take a look at this stock. It's an incredibly simple business. It markets and distributes its suite of cleaning and home maintenance brands. These ubiquitous products (eight of every 10 households have a WD-40 product in them) are recurring revenue in nature and have relatively high gross margins. It doesn't manufacture any of its own products (it contracts out to third-party manufacturers), so the company is asset-light and, as a result, produces incredible rates of return for its investors. Over the past decade, it has more than doubled the S&P 500 on a total return basis. Another attractive part about WD-40 is that it doesn't have to produce gaudy growth numbers to achieve a reasonable return for its investors. Management's target right now is to maintain revenue growth of 5%-9% annually while squeezing out some costs to produce a 25% EBITDA margin. Those targets alongside a steady diet of dividend increases and share repurchases should allow the company to significantly move the needle for the foreseeable future. It's hard to see why Wall Street pays no mind to WD-40. Perhaps the business is too simple, predictable, or boring to garner its attention. For a long-term investor, though, WD-40 can be a great addition to a portfolio. Daniel Miller (Control4): Control4 isn't well-known on Wall Street, at least not yet, and only recently went public during 2013. The company is 100% focused on the connected smart home, and as more and more households have systems that range from security, communications, remote control, and voice commands, to something as simple as lighting, solutions are needed to control everything seamlessly. That's where Control4 comes in: It offers consumers and businesses a platform solution with professional installation that can control hundreds of devices. Management estimates Control4 has only penetrated about 1.5% of its target U.S. market, leaving plenty of room for growth. That's what makes the company's recent move brilliant: certified showrooms. Control4 is launching 140 certified showrooms across the U.S., Canada, China, Australia, and the U.K., and each showroom will have ideal setups for consumers to pin down what system and solution works for them, as well as "WOW-ing," as the company puts it, potential consumers. These showrooms should drive more traffic and sales leads, and improve lead conversions. Those are factors that will help make Control4 a household name as more and more consumers need solutions for a growing number of smart devices within a home or business. It's also worth mentioning that for such a young company Control4 has excellent financials. Consider that over the trailing 12-month period through the first-quarter of 2018, the company generated $22 million in free cash flow, has $77 million in cash, and no debt. That puts the company in great position to acquire companies that can be folded into its business, expand internationally, or pursue other strategic growth projects. Wall Street hasn't heard of Control4 yet, despite its 191% stock price increase during 2017, but look for that to change over the next decade or two, and investors along for the ride could find themselves with a huge winner. WDFC Total Return Price. Data source: YCharts. Rich Smith (VSE Corporation): It's hard to be 100% certain which stocks Wall Street has and hasn't heard of yet. Wall Street is a big place, and is teeming with analysts who may or may not have heard of any given stock. But here's one thing you can be sure of: Even if someone on Wall Street has heard of VSE Corporation, no one on Wall Street is currently paying attention to it. According to the data miners at S&P Global Market Intelligence, VSE Corporation currently has no analyst coverage whatsoever on Wall Street. I think that's their loss. (And it could be your opportunity). Based out of Alexandria, Va., VSE Corp has a market capitalization of barely half-a-billion dollars. Yet although small, it's a bona fide conglomerate providing supply chain management to the United States Postal Service, jet engine maintenance to airlines, and vehicle and airplane maintenance to the U.S. Army, Air Force, Navy, Coast Guard, and Marine Corps. 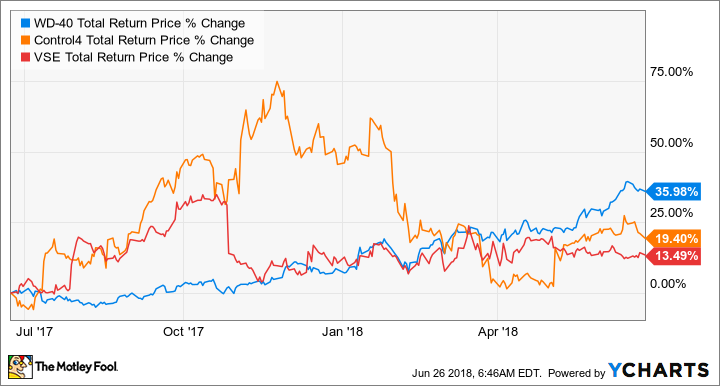 Sales at VSE Corp are up 57% over the past five years, and profits are up 70% to $39 million over the past 12 months, giving VSE Corp stock a P/E ratio of only 13.9. That seems a fair price for a stock growing earnings at better than 14% annually over the past five years. Plus, VSE Corp pays its shareholders a small dividend yield of 0.6%, after recently being hiked by 14%. VSE Corp seems like a better-than-fair value to me -- even if Wall Street hasn't even heard of it yet. Does The Street Have VSE Figured Out?